When the first fragments of Eoanthropus Dawsoni  more famously known as Piltdown Man  were discovered in 1912 near East Sussex, England, scientists believed they had finally found definitive proof of mankind's evolution: the missing link between man and ape. Over the next 40 years, more than 500 scientific essays would be written on the fossils, but the discovery was proved to be a deliberate hoax in 1953. The parts of a skull and jawbone, collected from a gravel pit in the village of Piltdown, had many experts convinced they were the fossilized remains of an unknown form of early man. But Piltdown Man turned out to be more of a patchwork man, his remains an amalgamation of the lower jawbone from an orangutan with the skull of a fully developed human. Piltdown Man has since become a byword for fraudulent or shoddy research in academic circles; no culprit has been conclusively blamed for the hoax, but fingers have consistently pointed at the man who supposedly made the discovery, amateur archaeologist Charles Dawson. 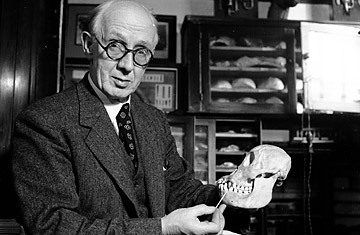 Read TIME's 1953 story on how the Piltdown fake was uncovered.